Your Guide to Greatness by Rhondalynn Korolak | Author, Business Acceleration Expert, Lawyer, Chartered Accountant, Clinical Hypnotherapis, Master of NLP | You can either look for the "secret" or be one of the few who are LIVING it! You can either look for the "secret" or be one of the few who are LIVING it! Let's face it, life's not always pretty. It's hard, it's messy and it's unpredictable. It's often stranger than fiction and it can break your heart. But as this book will attest, real life is also magnificent, beautiful and awe-inspiring. Is Optimism Killing Your Business or Career? "The pessimist complains about the wind; the optimist expects it to change; the realist adjusts the sails.” William Arthur Ward I was reminded of this brilliant principle last week when I spoke to one of my business coaching clients. We are living in interesting times.... the global financial crisis has impacted overall spending and consumer sentiment – and this has hurt many businesses and families around the country. It’s no good hoping that circumstances will change – in order to survive we all need to dig deep and find creative ways to work smarter not harder. Jim Collins, in his book, “Good to Great,” talks about this very interesting paradox that he calls “The Stockdale Principle”. According to Collins, “you have to be realistic about your current situation and yet, stay optimistic about the future”. General Stockdale was the highest ranking American prisoner of war in Hanoi, Vietnam. Over the years he began to notice an interesting phenomenon – optimism could in fact be a liability. His fellow prisoners (who were the eternal optimists) constantly set themselves up for disappointment. They set huge milestones – “we will be rescued by Christmas” - but those milestones came and went year after year and with it... their will to live. Conversely, the prisoners who looked at the painful day-to-day reality they were in and channelled their energies to the right places survived. This is not to say that the second group were pessimists but rather realists that maintained an unwavering faith in the end game, and a commitment to survive despite the brutal fact of their incarceration and torture over a period of years. Here’s how Stockdale put it in his own words: “I never lost faith in the end of the story. I never doubted not only that I would get out, but also that I would prevail in the end and turn the experience into the defining event of my life, which, in retrospect, I would not trade.” How many of us would look back on seven years of detention – with regular torture, dismal living conditions and an uncertain future – as an experience we would not trade? Do you regard the greatest obstacles or challenges in your life as the defining moment that shaped who you are today or do you choose to look at them as an excuse or reason why you have not achieved more? Have you ever sat back and thought how this distinction between optimism versus reality could apply to your business/career or your life in general? Where in your life are you ignoring reality in favour of being optimistic and missing a crucial opportunity to take action? Take for example my business coaching client that I mentioned above. She has an employee who doesn’t take responsibility for her actions, doesn’t pay attention to details and is often defensive and reluctant to take direction and feedback. This employee is negatively impacting the entire work environment as everyone gets caught up in the drama of it all. My client doesn’t want to let the employee go and is resisting doing what she knows that she must. She hopes that it will somehow improve without any action on her part – she is now learning the distinction between reality and optimism. When she sees the difference for what it is, then and only then, will she become decisive and take action. Another area where it’s easy to be blinded by optimism is in the financial arena. Do you have detailed financial reports, KPIs and cashflow forecasts in place to drive your decision making or are you simply relying on your optimism instead of reality? Failure to effectively plan in this area (especially in these tough times) could lead to a cash crunch and the demise of your business. Take a moment today to examine your relationship to optimism, pessimism and realism. Success belongs to those who operate from both sides of the Stockdale Paradox. The key is balance – knowing when to accept reality and take appropriate action AND never losing faith in the end of the story. If you can walk this delicate line of balance and responsibility, you increase your odds of making good decisions and this will lead to your inevitable success and breakthrough results. In life, we will all experience setbacks, disappointments, loss and challenges. What separates successful people from the rest is how you deal with those inevitable struggles. This is a very important distinction and it is what divides the winners from the losers. You must never confuse faith that you will prevail in the end — which is something that you can never afford to lose sight of — with the discipline to confront the brutal facts and reality of your current situation, whatever that might be. Written by Rhondalynn Korolak, MD of Imagineering Unlimited, Lawyer, Chartered accountant, Clinical hypnotherapist, Master practitioner of NLP, Thought field therapist, Melbourne, Victoria, Australia, internationally recognized business acceleration and leadership expert working with companies to improve their profitability and cash flow through financial insights. When you buy your copy now at the official store, you'll also receive a special bonus worth $397! 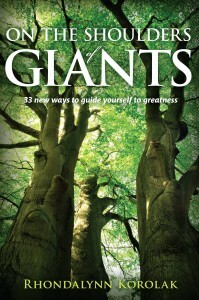 © 2014 Your Guide to Greatness by Rhondalynn Korolak | Author, Business Acceleration Expert, Lawyer, Chartered Accountant, Clinical Hypnotherapis, Master of NLP, based on On the Shoulders of Giants by Rhondalynn Korolak. All Rights Reserved.